24 Mac 2008 marks another milestone for FTEC and Intel Malaysia as it launches affordable extra lightweight notebook FTEC Smart Book at TecAsia Sdn Bhd, Lot 4.28 & 4.20A, 4th Flr, Plaza Low Yat, No. 7 Jln Bukit Bintang, KL at 11.45am. Kuala Lumpur, March 24 – FTEC today launched their first netbook PC- the FTEC Smart Book which is targeted at children in pre-schools as an educational tool. The FTEC Smart Book is highly portable and includes a set of unique features that specifically caters to the needs of young children who will be entering kindergarten and the primary grades. 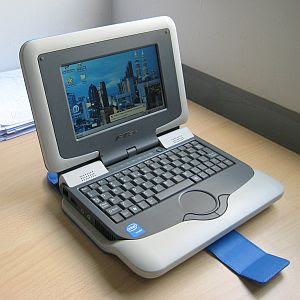 The netbook is equipped with a water-resistant keyboard and an advanced theft-control feature using a network-issued digital ID certificate, and is capable of running many applications including educational software. The FTEC Smart Book will come in two models offerings either a 7-inch or 9-inch colour LCD TFT display. Both models will also have the Intel Celeron M processor Ultra Low Voltage, Wi-fi connectivity and the Linux OS pre-installed. There is also an optional choice to add Windows XP starter edition for RM99. “We believe that early access to computers help children learn and we hope to see a positive impact of using computers in the building of the child’s critical thinking skills, communication and digital literacy. Through exploring computer experiences, these children build memory skills and learn how to seek out information,” said Tang Boon Koon (third from left), Managing Director of FTEC. According the Navin Shenoy (second from left), General Manager of Intel Asia Pacific, netbooks are highly portable PC devices that are optimised for Internet-centric uses. Shevoy added that the Smartbook is ideal for web consumption such as Web-browsing, email, instant messaging, social networking, online video viewing, photo viewing, VoIP, and playing basic online games. Tang added that FTEC expect to sell up to 2,000 units by June and with the Intel Atom approaching Malaysian shores, FTEC are hoping to see enhancements to the Smartbook within two quarters of the financial year. Meanwhile, the children from Sunbeam Home (kids in t-shirt) were also on hand to give reporters a demonstration of the Smartbook. Both the 7-inch and 9-inch FTEC Smartbook are retailed at RM1,199 and RM1,299 respectively and is available now at all TecAsia concept stores, major IT centres and retail IT chain stores. TQ Harlym for sharing info on FTec Smartbook in ur blog. In fact, I've read a bit abt it in The Star yesterday. Actually I just bought ASUS Eee PC a couple of months back. Pricewise its abt the same. But I still prefer ASUS - looks more solid !